When the Huygens probe touched down on Titan, it landed on arelatively soft patch of material similar to lightly packed snow, researchersannounced today. But to get to that soft patch, Huygens had to descend through atreacherous atmosphere where winds raged up to 270 mph, temperatures dropped aslow as -333 degrees Fahrenheit, and lightning was likely. Nearly a year after the probe landed on Saturn's largest moon,scientists are still poring over loads of data. Today, researchers releasedtheir newest findings in a series of seven reports published on line by thejournal Nature. The findings provide a better picture of some of the most basiccharacteristics of Titan, a smog-shrouded world that had eluded close scrutinyuntil Huygens and the Cassini mothershipteamed up for a series of observations. Titan's surface was unveiled as Huygens plunged through theclouds and fired up its Descent Imager/Spectral Radiometer (DISR). While theseimages did not show the pools of liquid hydrocarbon that many scientistsexpected, they do show the signs of flowing liquid in the form of brightnessvariations around the outlines of "ponds" and a "coastline"as well as what appear to be slopes carved by liquid drainage. Images taken after landing show several small stones andpebbles and that the general topography of the region is fairly flat, varyingonly 3 feet or so in height. 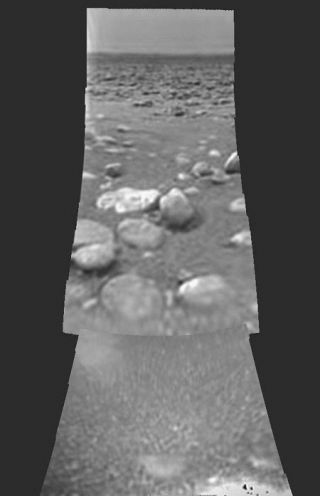 Images and other instruments ruled out thepresence of extensive methane ground fogs in the landing site. The surface of the landing site was neither hard nor fluffysoft, instead having characteristics similar to wet clay, lightly packed snow,or wet or dry sand, into which the probe sank a tiny bit after landing. Thecomposition of surface vapors near the probe showed that the surface was wetwith methane, which evaporated as the warm probe landed in the cold soil. Thesurface was also rich in organic compounds – such as cyanogenand ethane – not detected in the atmosphere. Some scientists speculated that a tide had just gone out andthe probe landed on the still-wet beach. Scientists had long suspected that Titan's atmosphere wasmoving around the moon faster than the moon was rotating – a physicalcharacteristic known as superrotation and previouslyobserved on Venus. Now, data from the probe's DISR instrument and the DopplerWind Experiment have confirmed that Titan's methane filled clouds do indeed superrotate. While the uppermost clouds – about 75 miles above thesurface – spin around the moon at about 270 miles per hour, wind speedsgradually decline as the near the surface. Here generally weak winds, gustingno more than a few feet per second, were observed in the lowest 3 miles of theprobe's descent. The probe passed through one other region of near zero windspeeds, from altitudes 62 to 37 miles. Scientists cannot explain this yet. During its descent, Huygens provided the first in situ look at what chemicals exist inTitan's atmosphere. The atmosphere is mainly nitrogen and methane, butscientists didn't know how these chemicals originated – did they arrivein their present form or were they originally part of other molecules and werechemically altered to the states seen today. The gas argon 36 was detected by the Gas Chromatograph MassSpectrometer in very low abundance, and scientists say this indicates thatnitrogen was originally present as part of ammonia. Also, the early atmosphereof the moon was at least five times denser with nitrogen than it is now,suggesting that some of the gas has been lost into space. Ratios of carbon isotopes also indicate that the atmosphere isalso leaking methane, and that there must be some period method forreplenishment, although none was observed. Some researchers predicted therewould be a large methane surface or subsurface reservoir that replenished theatmosphere, although that too was not seen. Also missing from the observationswas the signs of methane rain, which scientists believed showered the moon'ssurface. It could be that cyrovolcanoes– similar to terrestrial volcanoes except they spew liquid water andammonia from subsurface reservoirs – could be providing both theatmosphere and the surface with nitrogen and methane. "The current theories are that there is a region ofwater-ammonia mix in liquid form at some depth below Titan's surface –this is equivalent to the magma on Earth," study co-author Andrew Balltold SPACE.com. "These areone possible source for renewable methane on Titan." The Aerosol Collector and Pyrolyser(ACP) instrument analyzed particles as it passed through the clouds andreported the presence of nitrogen-containing organic compounds, which mayinclude amino, imino, and nitrilegroups – key components to protein formation here on Earth. These particles also clump together, perhaps providing afoundation for cloud formation, and affect temperatures and wind speedsthroughout the atmosphere. They also fall as kind of steady organic rain onTitan's surface, the researchers write, and could produce a global blanket witha potential thickness of half a mile or more. Researchers also used the Huygens Atmospheric StructureInstrument (HASI) during the descent to measure the atmosphere's temperaturefrom the upper layers all the way down to the surface. Temperature at thesurface averaged around -289 degrees Fahrenheit, which is warm enough for theexistence of lakes and rivers of liquid natural gas. Atmospheric temperaturesranged from -333 degrees Fahrenheit at the highest elevations – 870 milesabove the surface – to about -154 degrees Fahrenheit in the stratosphere,about 25 miles from the surface. The HASI instrument also detected electric activity that issimilar to lightning's signature. This was spotted around 37 miles above the moon'ssurface, which is also the region where the wind speed dropped to near zero.